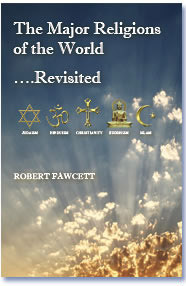 Responsa, (commentaries devoted to the explanation of the Bible, the Talmud, and halakha (the codes of Jewish religious law). 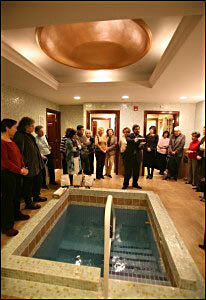 Mikvahs, which are ritual baths, are a ritual bath designed for the purpose of ritual immersion in Judaism. The word "mikvah", as used in the Hebrew Bible, literally means a "collection" - generally, a collection of water. Several biblical regulations specify that full immersion in water is required to regain ritual purity after ritually impure incidents have occurred. Most forms of impurity can be nullified through immersion in any natural collection of water. Some, however, require "living water," such as springs, or groundwater wells. Living water has the further advantage of being able to purify even while flowing as opposed to rainwater which must be stationary in order to purify. for utensils used for food. In Orthodox Judaism these regulations are generally steadfastly adhered to; consequently, the mikvah is central to an Orthodox Jewish community, and they formally hold in Conservative Judaism as well. The existence of a mikvah is considered so important in Orthodox Judaism, that an Orthodox community is required to construct a mikvah before building a synagogue, and must go to the extreme of selling Torah scrolls or even a synagogue if necessary, to provide funding for the construction. However, Reform Judaism and Reconstructionist Judaism regard the biblical regulations about ritual purity as anachronistic to some degree, and consequently do not put much importance on the existence of a mikvah. Some opinions within Conservative Judaism have sought to retain the ritual requirements of a mikvah while recharacterizing the theological basis of the ritual in concepts other than ritual purity. Ancient mikvahs dating from before the late first century can be found throughout the land of Israel as well as in historic communities of the Jewish Diaspora. In modern times, mikvahs can be found in most communities in Orthodox Judaism, and Jewish funeral homes may have a mikvah for immersing a body during the purification procedure (tahara) before burial.